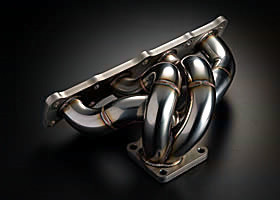 This is an Exhaust Manifold compatible with factory and made from stainless steel. JUN devised a pipe shape and a diameter to not disturb a flow of exhaust emission and reviewed balance between exhaust flow quantity and exhaust pressure. As a result, start of a turbo in the whole rev became smooth. It is possible to disappear to blow down completely by separating it into 1-2 and 3-4 just before the turbo becomes 50m/m by designing it to be 4-2-1 manifold, and designing it to stand up smoothly from the low rotation. JUN introduces completely different exhaust system compared with the maker of original exhaust manifolds. Note: image is for representation only. Actual product may vary. JUN Machine Shop of Japan is world renown for producing some of the fastest vehicles with their highly engineered tuning parts. Having proven themselves with such JDM supercars as the Nissan Skyline, JUN also has won many records drag racing the Honda Civic, time attack events with Subaru, and more. 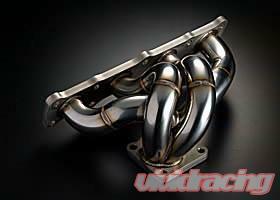 Vivid Racing is a direct dealer of JUN Auto Parts and ships direct from JUN to you the customer.